Whether you have the Gulf of Thailand on your wish list or you enjoy an island holiday here each year, this region makes a superb destination wedding choice. Koh Samui in particular is the quintessential island idyll. Full of friendly faces, swaying coconut palms, and sunsets seemingly painted onto the sky, Samui is ready-made for romantic celebrations. With the right information to guide you through the planning process, creating a Koh Samui celebration for you and your guests can be simple and stress-free. 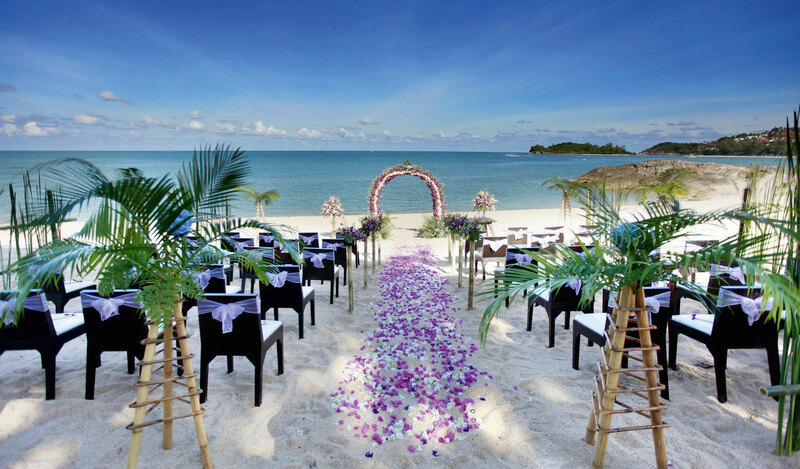 Let us lend a helping hand and show you the beauty (and benefits) that Koh Samui can bring to your holiday wedding. Related: We’ve done the heavy-lifitng for you and found the dreamiest wedding locations in all of Thailand here! Thailand’s affordable nature is one of the many reasons travellers flock to this glorious kingdom year-round. 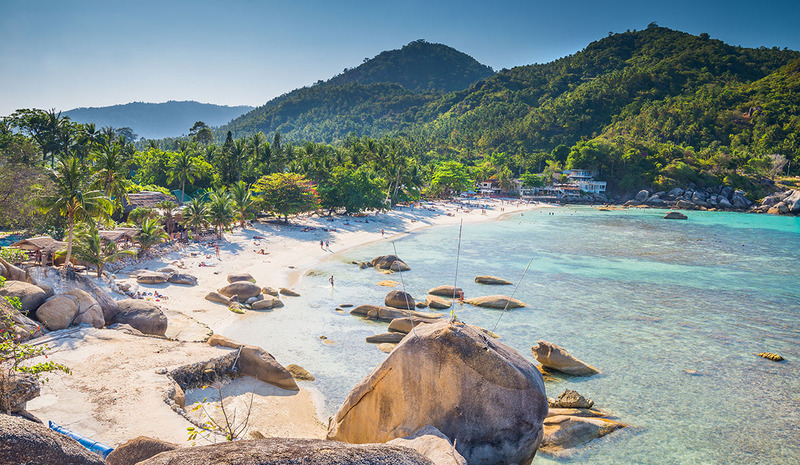 Though it does represent island prices, your dollar can really stretch in Samui, particularly when compared with the Australian, European or even Caribbean alternatives. From delicious food and gorgeous venues to island adventures and blissful pampering, you’ll be pleasantly surprised at what is included in your Samui wedding package. In fact, you’ll probably be able to boost your level of luxury without breaking the ceremony budget. And you’ll have the creative and practical expertise of one of Samui’s experienced wedding teams in your corner. Winning! Weddings are memorable as stand-alone events. But they become unforgettable when paired with exciting local experiences — which is why destination weddings are the go-to for many modern couples. As part of a Samui wedding celebration, you and your guests can revel in yoga, Thai massage, snorkelling or scuba diving, paddle boarding, cooking classes, temple hopping and of course, sunset chasing. Memories are made of this. Koh Samui is generously freckled with beautiful beaches, many of which are privately owned by resorts throughout the island. Based on which resort you choose and which part of the island you decide on for “I do”, you’ll find a majestic backdrop that truly aligns with your vision. Enjoy a Thai massage at some of the best spas on the island, including A’Lanna Spa or Eranda Spa. See you later, pre-wedding stress. Visit beautiful Buddhist temples including Wat Phra Yai and Samui Big Buddha for a taste of Thai culture and religion. Snorkel and explore the lush seascapes at Coral Cove, Silver Beach or Taling Ngam. Soak up the vibe and make a few new friends at one of Samui’s stellar beach clubs. Try Nikki Beach Samui or Centara Grand Beach Resort for a top-tier dining environment, cocktails that crush the game and coastal views that can’t be beat. A Thai island nestled in the Chumphon Archipelago, Koh Samui is undoubtedly sublime. However, it’s not immune to a little precipitation. If you’ve done any research on the region, you’ll be aware of monsoon season, which hits heaviest from September to December. February is probably the best time of the year for sunny ceremonies — you might even score a Valentine’s Day anniversary. Samui is the only island in the archipelago with its own airport, but it’s still modest in size. 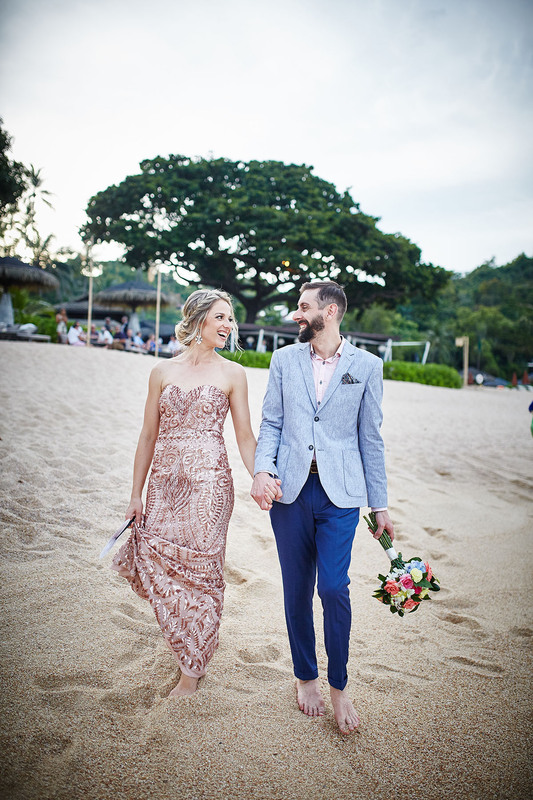 You and your wedding party may still need to catch a connection from Phuket, Krabi, Surat Thani or even Bangkok. And those landing in Surat Thani can always catch the ferry to Samui in less than two hours. Yes, Thai time is a real thing. The locals are a relaxed bunch, which is something that everyone can learn from. But it’s good to note that while the resorts and hotels will keep your schedule on track, you might need to shift down a gear during some of your island adventures. But what’s the rush? You’re in paradise! A calm, private bay for ceremonies and incredible accommodation in a lush, natural setting help make this eco retreat a standout. Nestled between Chaweng Beach and Fisherman’s Village, The Tongsai Bay offers luxurious rooms and villas with generous balconies and open-air bathtubs (many even have a private pool!) along with onsite spa cottages designed for couples, two swimming pools and delicious dining options. The hotel caters to Thai and Western weddings and serves up memorable receptions with their Tongsai signature hospitality. Wedding packages allow for customisation, perfect for optional services such as videography, fire shows and hair and makeup. Want to go really lavish? Praana Residence by SILK is an obvious choice. Due to its secluded nature and generous size, this escape goes beyond the average luxury villa rental. It feels like you’re getting a whole hotel to yourself! Six bedrooms form part of a gorgeous hilltop complex which includes an onsite spa, private cinema, two swimming pools and one serious sea view. And the dining is to die for, with thoughtfully curated fare that will impress even the most discerning palate. To read about more amazing wedding venues in Thailand visit our comprehensive directory.